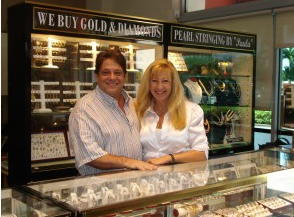 Serving Aventura for nearly 30 years, Scott Levin Jeweler is your FULL SERVICE JEWELRY CENTER. Scott Levin, MASTER JEWELER and CRAFTSMAN, will personally attend to all of your fine jewelry needs. We size rings, set stones, string beads and pearls, do custom designs and in fact ...THERE IS NOTHING "JEWELRY RELATED" SCOTT LEVIN CAN'T DO! Scott Levin also is a BUYER of OLD GOLD, DIAMONDS, PLATINUM, VINTAGE WATCHES and ESTATE JEWELRY. He pays among the HIGHEST PRICES for these items, in the South Florida Area. Conveniently located in the front of the International Jewelers Exchange - Scott Levin is your LOCAL, RELIABLE JEWELER, who is always at your service. Feel free to stop in or call and get a price quote over the phone for all of your jewelry needs.